Matt Ryan has played in all 48 Games since the start of the 2014 NFL season with the Atlanta Falcons. His average DK salary has been $7,035 and he has averaged 27.15 points per game. That equals a very nice 3.86 value. However, just 41% (20) of his 48 starts, have produced at least 20 points and 11 of those 20 came at home. He has also scored 20+ points in 8 contests inside the division, with four against the Saints and four against the Buccaneers. Our advice to you - just stack Matt Ryan/Julio Jones and ignore Devonta Freeman. Julio Jones has played in 18 of the 20 games Ryan has scored 20+ points and averaged 29 DK points (3.34 value), compared to a 3 year average of 22 (2.6 value). The duo averaged 56.15 points when Ryan scored 20+ points and Jones is in uniform. In week 4 last year, they combined for 90.52 DK points, their highest combined score since 2014. Ryan scored 38.52 while Jones scored 51 at home against the Panthers. Just four weeks later, they combined for their lowest total, with 30.32 points. Jones scored just 5.9 points, his 3rd lowest since 2014 which all came last year, battling injuries. Devonta Freeman has played in every game that Matt Ryan has scored 20+ points in since 2014, averaging 12.37 points (2.35 value), compared to a 3 year average of 15.11 (2.82 value). The QB/RB duo averaged just 39.13 points when Ryan scored 20+ points. Freeman has scored in the single digits more often than not (55%) when Ryans puts up 20+ points. He has even scored below 5 points in 7 of those 20 games! Only one time, week 3 2015, did Freeman outscore Ryan. The trio averaged 69.47 points in the 18 games they all played that Ryan scored 20+ points. Freeman's average jumped a point when Jones also played in those games. The best week they ever had was week 3 2015 when they scored 111.8 points in New York against the Giants. Freeman and Jones both scored in the 40s, while Ryan scored 23.1 points. The only other time they hit the century mark was week 4 last year in Oakland against the Raiders. Their worst week came back in week 4 2014, when they scored just 40.32 points against the Vikings, in Minnesota. Ryan (22.12) put up more points in this game than he did in the stacks best week, but Freeman (4) & Jones (14.2) combined for just 18.2 points. Even with Ezekiel Elliott eligible to play week 1, we love the New York Giants defense against the Dallas Cowboys, at their price. 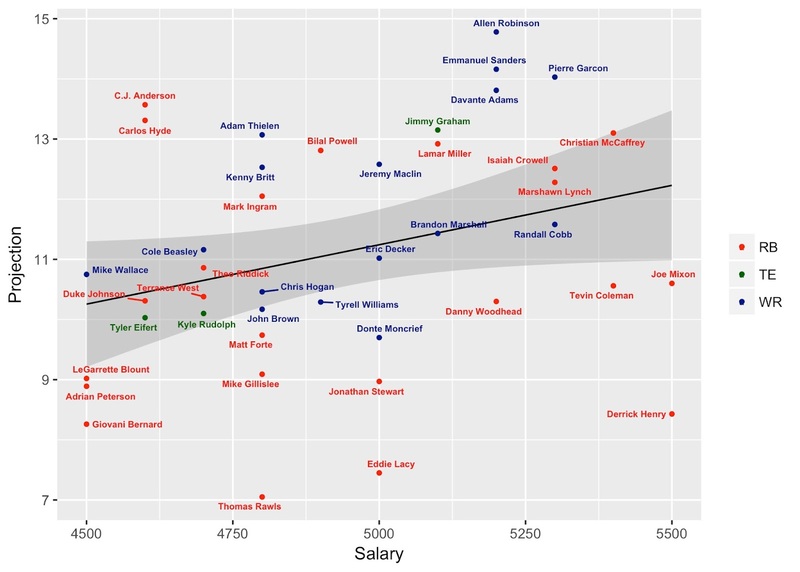 After you combine them with Ryan/Jones, we are left with $5.3k per player. Starting at the TE position, to increase that average per player at RB & WR, we suggest choosing between Delanie Walker ($4,300) & Zach Ertz ($3,500). Lets save as much money as possible and add Ertz to our lineup. Maclin should have the lowest ownership of the three, so lets roll with him, as we are trying to win a GPP here! With $5.8 remaining per player, lets find our 3rd WR, someone under $6k. Larry Fitzgerald ($5.9k) & Jamison Crowder ($5.6k) are two of the best options in this price range, but we will move forward with Crowder to save money and because of his projected low ownership. Now with Jones, Maclin and Crowder as your WRs, lets attack the RB position with about $6k to spend per back. There are two paths to victory from here - add another star WR at FLEX or spend your money on RBs. 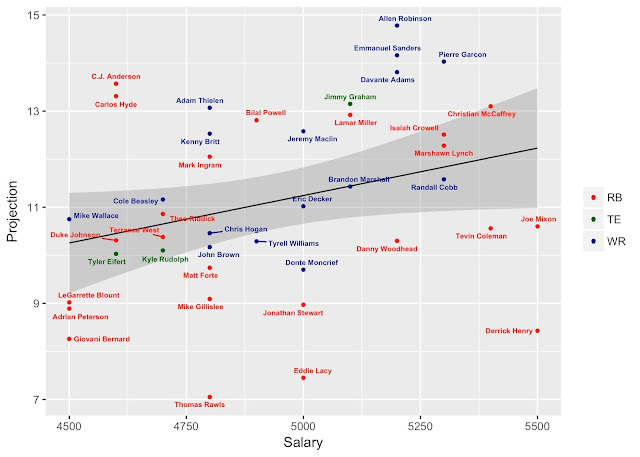 You can add Antonio Brown ($8.8k) and then run with some combination of Ameer Abdullah/Frank Gore/Carlos Hyde at RB. The other option is to add Jordan Howard ($6.3k) & Todd Gurley ($6k) and then add your favorite remaining option at $5.6k or less. We already broke down how the Falcons trio performs together, but here is a quick breakdown of their numbers on FanDuel. After inserting Ryan/Jones/Matt Prater/Rams into our lineup, we were left with $6.6 per player. If you want to spend $100 more on the Rams against the Colts, we understand. Again, first thing we did was head straight to the TE position to increase our average per player. At $5.9k, Ertz is the top TE under $6k. If you want to save cash here, you can go with Giants rookie Evan Engram ($4.9k) or add Ryan's TE in Austin Hooper for just $4,700. With Ertz, we now have $27.3k for two RBs and two WRs, just shy of $7k average. 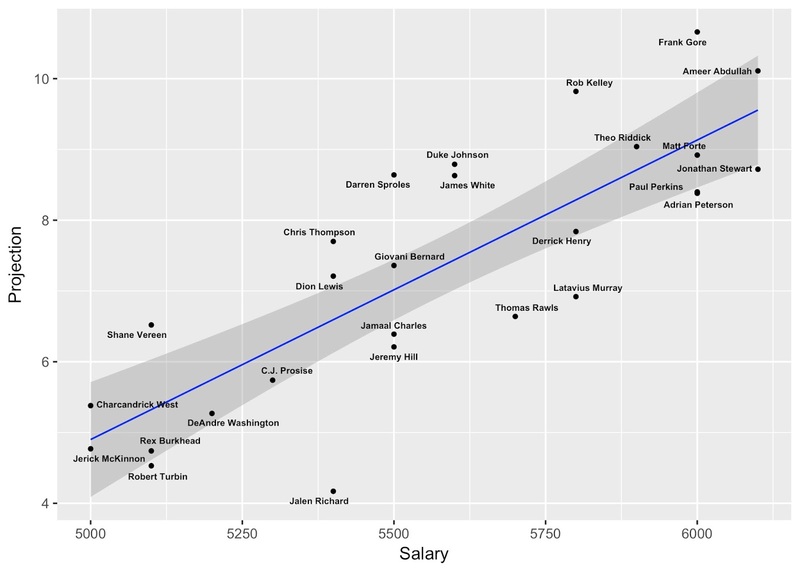 We are going to try to equally divide that money up at the two positions, but we will start by adding a value WR. Terrelle Pryor at $6.2k is great value and that Redskins/Eagles games is looking like it's going to be a shootout! Crowder is priced at $300 more than Pryor. By adding a value play at WR, we can now afford to add someone as expensive as Jordy Nelson ($7.7k) and still have $13.4k for our RBs. Or you can find another cheap WR option and spend your money at the RB position by adding David Johnson and Gurley! To continue our exercise, we will add Nelson and go searching for RBs. The Colts will be without QB Andrew Luck, which means their offense will have a bunch of three and outs against the Rams defense. That means a ton of touches for Gurley, who at $7.3k has the same price tag as Leonard Fournette! What you are left with is $6,100 to spend on any of the following RBs to complete your week 1 FanDuel lineup.